Whether you are a working mom or a stay at home one, one thing that you probably fret about every now and then is what you are going to pack for your kids’ school lunches the next day. Your kids won’t like sandwiches every day, even if you try and experiment with the fillings as much as you can. To help you innovate in the kitchen and keep your kids healthy and happy, we have listed the top ten lunch ideas you can start using right from today! You can make a banana dog in a bun. Take a hot dog bun and slice in half. Spread cream cheese or peanut butter on one half and honey on the other. Put a peeled banana inside, and add brown sugar, raisins, or chopped almonds as a topping. Filling and wholesome. Try a veggie wrap if you are a family of vegetarians. Spread cream cheese on a tortilla roll and put in a filling of vegetables steamed and stir fried in olive oil, with salt to taste. Wrap the tortilla into a roll and throw in a lunch bag. Don’t forget to seal. You can do a variation of the veggie wrap with chicken. Boil and de-bone the chicken and saute with chopped onions, a little garlic, cubes of tomato, salt and pepper. Before wrapping up the tortilla, add a little mustard. Instead of the cream cheese, use mayonnaise. Macaroni steamed and light fried with a dollop of butter with a little salt and pepper is a great filler. Top it off with grated cheese. Make meatballs the night before, and serve on a bed of rice. Add some lettuce and steamed vegetables and on the side, have an optional sauce. It works best if the sauce is hot and sour. Boiled and chopped eggs make for great sandwich fillings. Add tomato ketchup, a dash of butter, pepper, salt and little rings of onions and chopped parsley. Layer between two slices of brown bread for a tasty, easy delicacy. 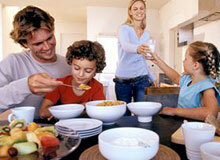 However much your kids may hate it, one day of the week, have them stick to fresh fruit. You can also pack them canned fruit in natural juices. But fruit in syrup is a no-no. It might take a while to cook, but pork or chicken dumplings are a very healthful option. Cook the meat lightly and spice them with a light sauce. Wrap in a sheet of dough and steam until cooked. Throw in fruit muffins and chocolate chip cookies made at home rather than ones you bought. They will be lower on calories but the children will love it. Apple cake and yogurt are good for kids with a sweet tooth. One day of the week, give your kids enough money to buy lunch. Do not try to monitor what they will be buying. They need this bit of independence, but do encourage them to stick to light and healthful options rather than deep fried, heavy foods. Breakfast is the most important meal of the day. Look at it this way- it is the first meal you have after a gap of over ten hours, and it sets the body machinery working after a prolonged period rest through the night. If you have a breakfast that is way too light, you will find it really hard to work efficiently or concentrate through the day. But who wants the same old toast and fried eggs and ham for breakfast day after day? Of course you want to try new recipes. But then, they can’t take too much time. Whatever you make should be easy on the digestive system, yet high energy and filling. 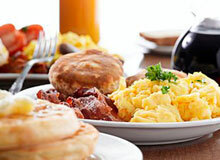 Here’s a list of top ten breakfast foods that are easy to cook and tasty too. Give the regular omelets a miss and cook frittatas for your family. All you have to do is beat eggs together with milk or cream, and ad a filling of your choice. It could be anything from shredded chicken to slices of ham or cooked potato. Vegetarians can add tomato and a little baby corn. Cook on the stove and serve hot. Pancakes make for great breakfasts once in a while. Mix flour and baking powder together with sugar and eggs and beat till fluffy. Fry on the griddle till lightly browned. Have with syrup or honey or fruit. Add eggs, milk and butter to a mixture of flour and baking soda. Bake on a waffle iron and add slices of ham on top. Serve with scrambled eggs. Dip slices of bread in eggs beaten with a little milk. Add cubes of tomato, onions and green chilies if you like. Fry on a low fire. Carefully mix peanut butter and boiling water and smear over toast. fry in butter and serve with honey or jelly. Use leftovers from the night before. Mix cornmeal mush and nuts and let cool on a wet bread pan. Slice and broil on a lightly oiled griddle. Serve with jam. This goes with anything remotely sweet. Some days, just have plain cereal with a helping of fresh fruit and cream. Try an Indian breakfast one day. Make dough of flour and a cup of water and knead well. Troll out into discs with a rolling pin. Deep fry in oil. Serve with a spicy potato curry. Alternatively, you can have idlis, dhokla or stuffed parathas. A Chinese breakfast with dumplings and noodles and steamed vegetables make for a welcome change. Have muffins for a late Sunday breakfast. Try different flavors including sweet potato, coffee, honey, raisins, fruit and nuts. On special days, make a breakfast tray for your mother, spouse or partner. Make French toast or pancakes. You could have ham and eggs after the English fashion. To go totally overboard, have fried sausages with ketchup. On Valentines’ day, you can do the strawberries and cream routine at breakfast rather than at midnight. You don’t need to spend a fortune on food to stay healthy and have high levels of energy. A lot of people lead perfectly healthy lives, and yet they spend only a small fraction of their month’s budget on food. You need not buy organic food or expensive supplements and shakes to be fit. All you need is a balanced diet. In this article we will tell you how you can spend a modest amount on food and at the same time get your fill of all essential nutrients. and ingredients at the supermarket. Try visiting your local vegetable vendor and grocer instead. You can get your meats from the local butcher. Yes, you have to do some dressing and curing then, but just think of how much you can save. Local store prices are often significantly lower than their counterparts in supermarkets. By buying from your local market you will also be making a positive contribution to the local micro economy. If you have to shop at the supermarket, make a list of exactly what you need. Don’t overbuy. For instance, if you need three cartons of milk to last you a week, don’t buy four, even if you get the fifth for free. You may think you got a great deal, but four cartons will cost you more than three, and you don’t even need the fifth one that comes for free. Similarly, buy fruits and vegetables by number rather than by weight. The same goes for eggs. Buy a dozen and use them all up in a week. Only then should you go back and get the next dozen. Never be tempted by offers on food. Only the buy one get one free offers make some sense. But don’t fall for these if you don’t need the food. Packaged foods are fairly more expensive than home cooked food. They are not good for your body if you continue to consume them over an extended period of time (they are much higher on calories than what you rustle up at home). You can make the same things at home with a little guidance from a cook book. Trust us; they will turn out more delectable if you put your mind to it. Stick to food that is easy to cook. For your kids’ lunches, make sandwiches with different fillings. Cook in large amounts and freeze what you won’t need or the next meal. You can thaw them in the microwave for subsequent meals. To save energy, eat raw salads with a light dressing and gorge on fruit. Cooking in the microwave is more eco friendly than cooking on a stove. 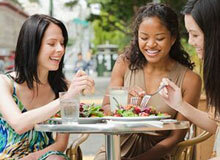 Eat out as less frequently as possible. You could set aside a couple of days a month for dining out if you can’t live without it. That comes as a huge money saver, and helps you stay healthy too. 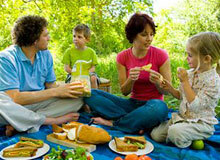 One way of having unadulterated fun with your family or friends, or even your colleagues is going on a picnic. You can also go on a romantic picnic with your significant other and have a blast. Planning a picnic, whether it is for two or ten, can be a real entertainer as you try to accommodate everyone’s interests and tastes. It starts getting worrisome and stressful only when you start thinking about the menu. What is something that is easy to cook and nutritious, and will find favor with everyone? Is there anything at all that is going to please everyone? You’ll need a bit more than culinary skills to put together a grand picnic meal. That bit is a way of knowing what people expect, and a little imagination. You can combine the theme of a picnic and a potluck to minimize the effort each person has to put in. each guest can get one dish. If there is someone who hates cooking, assign the task of bringing coffee and soft drinks to that person. For the rest, read on. Have a basic round of appetizers. An assortment of dips, like onion dip, hummus, and cream cheese to eat with different kinds of bread is a good idea. Add devilled eggs and stuffed potatoes or tomatoes. Potato chips will be especially loved by the kids. You can also try bringing marinated mushrooms or olives preserved in brine. Bring biscuits for kids who are fussy about their food. Now try and make combinations that work. For instance, you can have pita bread with hummus or French bread with onion dip and ketchup. You can spread the cream cheese on crisp biscuits and top it with olives and a sprinkling of pepper for a savory snack. You will probably want cold meat for a picnic lunch, whether it is chicken, pork or beef. Cold smoked salmon or canned tuna is not a bad option. Sandwiches are the old fashioned picnickers’ favorite thing. Play around with the fillings. Use egg salad, chicken and lettuce with a helping of mayonnaise, a whole tuna and mustard, or the classic peanut butter and jelly. You don’t go on a picnic everyday, so you might go that extra mile and bake a meat pie for everyone. To round off the meal, include a chicken Caesar salad or a shrimp salad with capsico sauce. For vegetarians, leave out the meat. On the side, have cold potato salad or Cole slaw. You definitely need a sweet something to eat at the end of lunch. Fresh fruit with canned fresh cream is a healthful option. You can also have a fruit cake, or chocolate chip muffins or cupcakes, or bread pudding in little cups. Don’t forget the drinks. Carry enough lemonade, iced tea, fruit punch, packaged smoothies, juices and coffee for everyone. We don’t have to remind you to carry plenty of water. If it is an adult’s only picnic, indulge in a good wine.